The Drill Hall Emporium: new in store...French bottle lamp and carrier, director's chair, French stool and a cane chaise longue! new in store...French bottle lamp and carrier, director's chair, French stool and a cane chaise longue! How wonderful is this lamp? 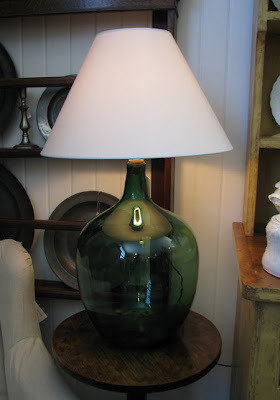 It is made from an antique French glass bottle and is currently lighting up the very back corner of the store. We will have other lamps similar to this coming into the store over the next week, including a pair of smaller bottle lamps and a large blue glass example. 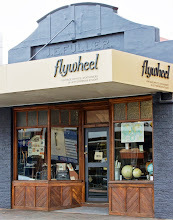 I am very excited...I have already worked out where in the store they will go! This French bottle carrier is a little different to most that we find as it has remnants of a green paint. These are great for carrying wine and other drinks to the outdoor table. 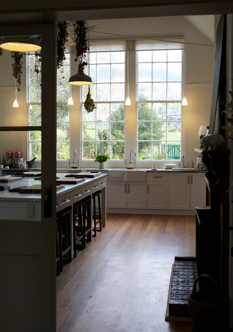 They can also be turned on there side for a unique wine bottle display on a shelf. 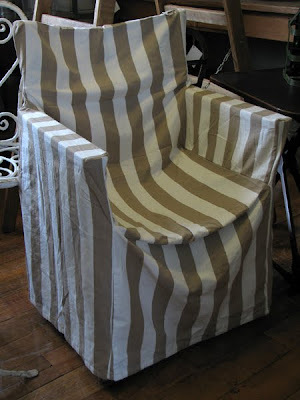 This is a vintage wooden framed director's chair which has been covered with a striped slip cover. These chairs are useful as they fold up when not in use and are very comfortable as well. 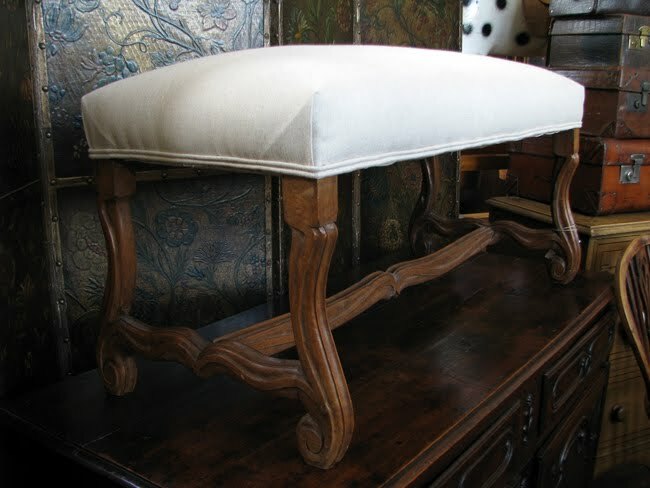 My favourite piece that came in this week is this French carved walnut stool. We have had it recovered in a neutral Irish linen. Very chic. I imagine this piece at the end of a bed...perfect for sitting to put shoes on. The new stock looks fantastic. I seen the french glass bottle lamps in a mag. a few years ago and have always admired them. The pick for me (as well as for you) is the linen covered french walnut carved stool. If only I had more room in our bedroom...oh to dream...20 years from now it will not have gone out of fashion....a classic. Speaking of classics, what is it with taupe and white that I have always loved. Those stripes are looking good on the directors chair. Hope you are enjoying your week and have had a little time to sit and relax with your magazines!! Just a little bit fancy!!!! !